This guide contains information for the Administrators of MailRoute Email Protection Services: detailed information on setting up your account and managing domains, mailboxes and settings. It assumes that you are familiar with administering email services for an organization. A Customer has one or more Domains. A Domain has one or more Email Accounts associated with it. As a Customer Admin, you're in control of all your domains and all your mailboxes. An admin can add or remove domains and change their email delivery settings, add and edit allow/blocklists, default filter and notification settings. They can add or remove mailboxes, set their per-mailbox settings, and view their individual email quarantines. You can make all these changes through the MailRoute Control Panel at https://admin.mailroute.net, or via our API. 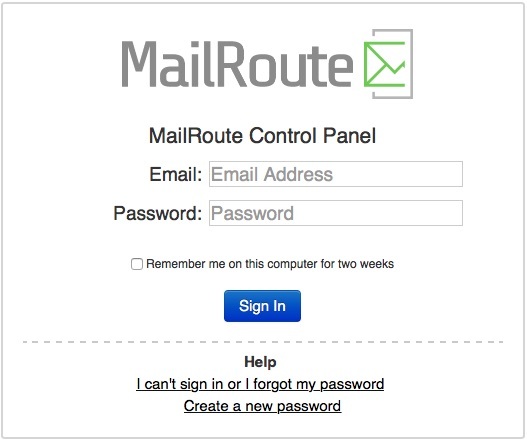 Once you've signed up for MailRoute, you're provided with an administrative login for the MailRoute Control Panel via email. Visit https://admin.mailroute.net and login with your email address and password. See this article for step-by-step login instructions. The options at the top of the Control Panel provide quick access to all your Customers, Domains, and Email Accounts. In addition, if your login email is also on a domain that is filtered by MailRoute, you can access your own personal Quarantine and your individual mailbox settings.